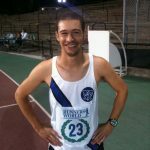 Tom Barnes, Australian World Cup team member, Melbourne University PhD student and Melbourne University Athletics Club member has continued his successful 2010 with a silver medal at the Victorian 5000m Walk Championships at Olympic Park on Thursday, 18th of February. Not long after being selected for the Australian Team for the 50km 2010 Walk World Cup in Chihuahua, Mexico, Barnes dueled with Olympian Chris Erickson over 12 and a half laps of the Olympic Park track to record a time of 21:29. Jarrod Pageot carried his good form into the All Comers meet, going beyond 7 metres again in the long jump, to win with 7.05m. Janelle O’Sullivan won the high jump with a leap of 1.75m and some strong attempts at 1.80m. Hannah Alderton took second place with a jump of 1.70m. Hamish Beaumont took second in a small 3000m steeplechase field, crossing the line in 10:18, a personal best. Will Vigors ran a season’s best in the 1500m, 4:23. Carmen Deane took on Tamsyn Lewis in the 400m hurdles and ran well to record a time of 1:09.91. Sophie Barker recorded a season’s best in the 1500m, running 4:42 in a strong showing. Lisa Wolski dashed over the 100m track in 13.20 for fifth place. Michael Cugnetto Tendyke ran a strong 400m in 52.19 to signal an impressive return to form. On Saturday, 20th of February a group of Melbourne University Athletics Club members ventured to Aberfeldie for the Peter Norman Classic. 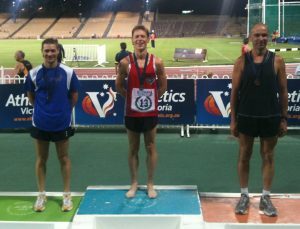 Stan Goryachev ran well to make the final of the Victorian 100 yard Championship and recorded a time of 10.4s. Club President Stephen Edwards hit the runway in the triple jump and landed a 14.21m jump, a good sign for the upcoming championships.